Visible crew/equipment: When Anne is at the train station waiting for Matthew to pick her up, you can see the camera crew reflection in the station window. 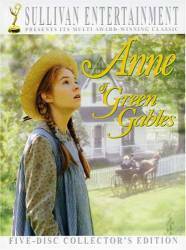 Other mistake: When Marilla shows Anne to her room, Anne's hat brushes Marilla's face. As Marilla turns you can plainly see that she is having a hard time trying not to burst out laughing. Anne Shirley: Wilt thou give me a lock of thy jet black tresses? Diana Barry: But I don't have any black dresses. Diana Barry: Gilbert told Charlie Sloan that you were the smartest girl in school, right in front of Josie. Diana Barry: He told Charlie being smart was better than being good looking.